There was a time when the earth was a vast, largely unexplored, seriously misunderstood place. The world was, for many, a frightening multiverse of reality, unreality, and spectacular fantasies. These perceptions inspired notions of security and insecurity based on fanciful myths about our connectedness, or lack thereof, with each other and the various phenomena around us. In an unexplored world, the fear of the unknown drove a sense of danger that tended to cripple the possibilities for growth and needed change. Oceans were seen as the home of terrifying monsters. Heaven was above and beyond the vast blue yonder. Hell was below the ground underneath us. There was up and down, and most people were safely unaware of the dynamic outer-ness of our experience in time and space. Our fate was in the hands of the gods who ruled over us like impetuous bastards, more preoccupied with their own vanities than with the needs of their unfortunate subjects. For many in such a world, fear, inspired by a sense of ever-present danger, reigned supreme. An uncontainable inquisitiveness coupled with an unsuppressable adventurous nature have combined to empower our desire and determination to face down the gods. In this quest we have come to realize that the only real limits to our ability to master and enhance our world are those we place on ourselves through fear and a lack of industry. So much has changed in our world, but the sense of danger that we have come to know so well still lurks. Danger is real. It wears human and animal faces, and it takes the form of every element in and around us. It lives and moves with us in every facet of life. It is, as we are. In the presence of danger our world either shrinks…or it becomes larger. Facing a perceived threat, we may limit ourselves to the narrowed path forward created by it, or we can look beyond the presumed source of that threat to a more expansive view of our world and the variety of options available to address it. And yes… there are options available to us beyond those reflexively proposed by parasites who have an interest in cultivating the fears of others toward their own ends. Beyond the “acts of God” over which we have little or no control, and beyond the convenient formulations of vultures who thrive on the tragedies that consume the lives and prospects of multitudes, we have a responsibility to critically examine the causes and sources of many of the threats we all face. This responsibility is all the more critical at a time when terrorism is alive and well among us. Our ability to overcome the sense of danger that freezes us in our path and severely limits our perceptions and our choices, requires us to avail ourselves of substantial moments of truthfulness. The development of this ability is a function of our openness to the fact that we share some responsibility for the awe-full nature of every threat we confront, or that confronts us. All threats have a subjective component. We are either complicit in their creation, culturally invested in their propagation, or we allow ourselves to be objectified by them out of fear. In a world where we are intellectually and spiritually drenched in the us against them mentality, we have for the most part ignored the reality of the us in them that more truthfully describes the developments around us that occupy our collective attention. It is this critical omission that results in our stumbling from one unfortunate political and cultural circumstance to the next. When faced with the results of our inability or unwillingness to honestly analyze the factors that make up the critical dilemmas confronting us, we resort to the easy answers that ignore our part in their creation. We want remedies for what ails our world, but in the absence of factual diagnoses of the problems as they are, we are left in a quagmire of superficial, and at times dangerous interventions that either lead nowhere, or that make matters worse. 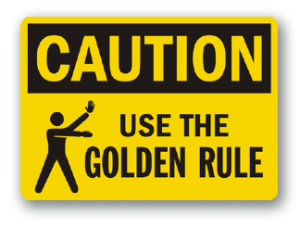 In a time when we must move with caution in our every activity, it behoves us to apply the golden rule in all our interactions. An impressive fact of our common experience is that advances in technology are always combining to have the effect of shrinking our world. There was a time when it took months to physically make contact between various land masses and countries. The journey that once took months now takes a few hours. Email has replaced snail mail and the Pony Express. Wire transfers have made the old methods of moving currency redundant. Telephone has progressed to video phone. In fact we have come so far technologically, that the possibility of actualizing the “beam me up Scotty” phenomenon no longer seems far-fetched. We have shrunk both time and space, thus making our world smaller, more accessible, and more connect-able. All these facts have combined to create a reality in which we are now able to affect each other in ways not previously possible. A smaller world brings us closer together. As we become closer, our shared values and our common goals and objectives become more obvious… and so do the things that create conflict between us. One outstanding reality of an ever shrinking world is the need for us to learn to share the spaces we occupy, and the resources in those spaces, in ways that do not create and elevate conflict as an inevitable fact of our communal experience. The creation of conflict is antithetical to the most basic of human instincts… the instinct to survive. This instinct is at the very core, and is an essential part of the foundation of every value system we have developed. As human beings we rationalize and define our behaviors, both individual and corporate, in accordance with our perceptions of how we should be, and what we must do to thrive in our social environment. The shared values and objectives we have articulated in our communal experience are expressions of such perceptions. The ultimate formulation of these values is codified in the commandment: Do unto others, as you would have them do to you. It is our obedience to this code that allows for the possibility of peaceful and functional community. It is our violation of it that creates violence, and the subsequent destruction of community. It seems therefore that our coexistence, as individuals and as communities, must be a function of morally informed shared values, and social objectives that are undergirded by the best interests of everyone. In the absence of a codified and enforced system of values that seeks to guarantee the basic rights of individuals and groups to shared space, and to fair access to the resources in that space, conflict thrives. Whenever the most basic of our human aspirations, the need and the right to survive, is threatened by a disregard for the most fundamental code… to be treated as a fellow human being… we have the most fundamental reason for, and a cause of the violence that is all too often a parent of the insecurity that then arms us for more violence. In the presence and operation of a system of behavior that violates the humanity of others, the us against them mentality thrives. The code: Do unto others, as you would have them do to you… must have universal application in order to be valid. It must not, and cannot make exceptions for skin color, class, national origin, religious belief, gender, physical disability or ability, sexual orientation, or idiosyncrasies of any kind or cause. The prejudices implicit in these various convenient classifications have been prime factors in the victimization of individuals and groups throughout history. In their efforts to justify the claims that serve their unjust perceptions and behaviors, groups have articulated and appealed to less civilizing, and blatantly inferior statutes. But despite every attempt to sanitize these corruptions of civility, we know beyond the shadow of a doubt that there is no law more complete in its distribution of justice than that which is outlined in the code above… there is a reason we agree that it is the golden rule. In fact this code has been the very foundation of every viable system of justice predating the earliest recorded civilizations… prior to Hammurabi, and before Moses. The obvious moral validity of this rule stands out through the present day. It is the nail on which the protective coat called Justice must hang. The engendering and proliferation of the us against them mentality is in its very essence a dynamic that results when a group or an individual perceives others as threats to their occupation of communal space, and to their access to the resources in that space. The culture that proceeds from this kind of mentality corrupts the very perception of what community should be, and consequently every single relationship in every unit that makes up community. This expression of a corrupted humanity is the dynamic at work in societies that foster racism, sexism and genderism, and every form of economic and social inequality. The assertions of the late Emperor of Ethiopia are as true then as they are now. They are as applicable to the world in which we now live, as they were then throughout colonized Africa. The possibilities for the corruption of our communal experiences are ever present. They are as close as every insecurity we harbor about our chances of “making it “ in the world in which we live. They are as real as every prejudice we cultivate about those we have not taken the time and effort to get to know and understand. They are as alive as every hateful impulse cultivated by those who have allowed fear to overshadow the possibilities of brotherhood. They are as present as every effort we have refused or ignored to take toward our own development and prosperity. As far as the existence of the threats that keep us awake at night are concerned… we have seen the enemy, and it is in many instances… us. It has become a function of convenient habit, both for individuals and groups, to point the finger at others in our pursuit of the villains responsible for the corruption of our ever shrinking world. The truth, however, may be more clear if we take a moment to examine the influences that are playing a role in our own cultural formation. It is always easier to identify the causes of the dysfunctions we face in the behaviors of other individuals, or groups, or nations… than to face the uncomfortable reality that there is as much of us in them as there are …them. Our lives and our mutual prosperity matter, and we must evidence that as a constant function of our every behavior. That is as true for every individual as it must be for every group. While we must be vigilant in securing our humanity against the assaults of others, we have as equal a responsibility to develop our own human potentials by every just means available to us. Beyond this, we must guard against our cultural propensity to inflict the harm on others that we do not want to be the victims of ourselves. The Golden Rule must become and remain the standard that we aspire to in our efforts to create peaceful and prosperous communities. As members of societies evolving toward a greater operation of Justice, we have a sacred duty to be part of the articulation and institution of laws that embody the universal scope of the ancient code that expresses and protects our claims to a common humanity. There can be no justification, religious or otherwise, for our denial of equal treatment to those we perceive to be different. To do so is antithetical to the nurturing of the greater civility that a truly moral community aspires to. In a world constantly evolving toward greater efficiency in our occupation and use of time and space, we are being challenged more and more to be greater adepts in our perception of the values and communal objectives we must develop in order to coexist peacefully. The alternatives to peaceful coexistence in the brave new world that advances in technology is foisting upon us are not at all attractive. We can learn to live together, or suffer the consequences of our existential myopia. Ultimately we must come to realize that a precondition to prospering together is the establishment of Justice in accordance with our most primitive instincts… the will to survive. That will to survive must be seen in terms of our Us-ness… our connectedness of being. The us against them mentality must therefore give way to the reality that there are now technologies that make us or them an unviable choice. Behaviors that articulate the prospect of our mutual annihilation are inimical to progress in our world. In the interest of a world that can continue to develop and prosper, we… whether we find ourselves in Asia, in Africa, in Europe, in the Americas, or in the Middle East… We must identify and connect with those ways of being that enhance our own fecundity, and that of our neighbors. We must face the fact that there is no wall that we can build that will negate the essential interconnectedness that is now a physical, cultural, and technological reality of our lives. We can attempt to shrink our world to fit our unjust idiosyncrasies; but expanding our horizons to be more facilitating of the shared needs of our common humanity remains our only real hope for a secure future.